1; even having a lead early ! – it seemed like if Indiana would have a good shot against a Minnesota team that had lost its last four games and was sporting the second-worst defense in league play. There was little intensity. It was a going through the motions affair where Indiana just seemed to feel like another loss was inevitable. This was a contrast to much of the losing streak. While Indiana has struggled mightily over the last six weeks, effort hasn't really been the issue. But that was not the case today. This was the first time it looked like the Hoosiers had given up in the contest, and that is not far from the schedule. Minnesota won this game on the back of an inspired performance from Jordan Murphy (23 points, 11 rebounds) as the Hoosiers had trouble with the double-double machine once he got the ball near the basket. But this is a victory from the Golden Gophers, a game in which they pushed the lead all the way out to 30 in the second half, also came from an unlikely spot: the 3-point line. Minnesota has shot just 31 percent from distance this season, good for only 313th best in the country in that category. And just 19.7 of his league points had come from 3-point range. But that changed in a big way this afternoon. The Gophers got lucky with two banked-in 3-pointers, as well as a desperation heave from Daniel Oturu as the shot clock was winding down, in the first half. It meant Minnesota entered halftime 5-of-8 from distance. 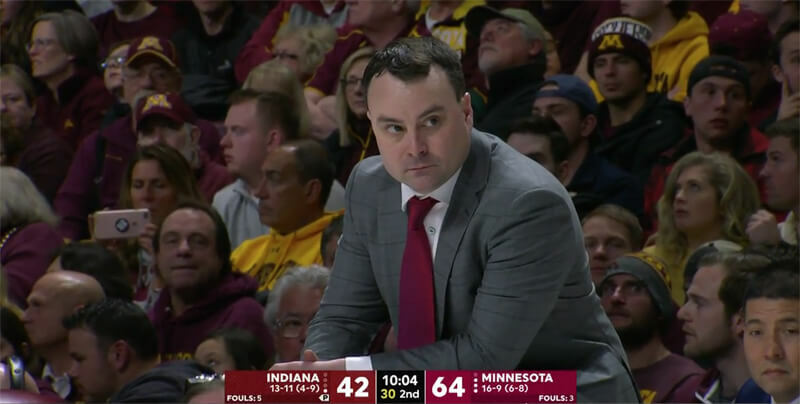 But as the second half got going, and Indiana's defensive effort dwindled, it allowed for a number of open looks from distance from Minnesota and the Golden Gophers capitalized in a big way. They hit 12-of-22 (54.5 percent) from the 3-point line, their most makes of the season. That meant 42.8 percent of their points came from deep this afternoon, a 23.1 percent increase over their average in league play up to this point. Indiana's offense, as its for most of Big Ten season, was discombobulated for much of the contest (.91 points per possession). Often, Romeo Langford was an afterthought in terms of getting him the ball in position to succeed. He had just six field goal attempts. And even when Langford did the ball, he often wasn't very aggressive. This was without a doubt a new low for the Hoosiers. And man oh man, Indiana still has six games to go. Will this be as bad as it gets?